mage1337 wrote: Lastly, what about parapets? Are they worth getting? Can they just be added to the RS "as is" with no other parts? And anything else vital to castle modularity I'm missing? For example, should I be going for Tower Roofs, Advanced Stone Builders, Butresses or Cube Spacers? Are any of these parts more useful than I am first understanding? geekjeff wrote: Parapets are cool, but I don't know that you're getting enough small towers to get a lot of mileage out of them. But they're pretty cheap, if you want a pack to experiment with. I struggled with this myself as I'm not getting a ton of 4" towers (just too expensive to do both sizes this go round). However, you should note a couple things about the Parapets. 1) You can use them on CBS stuff. Ie. If you have enough KS3 stone stuff, you could add a square tower (or interior structure) with Parapets hanging off of it. 2) While towers are one option on the parapet (4"), you could also add a 2 small Round Crenelations and use the Parapets with no other purchases. So for $70 unpainted, $96 painted, you would have 2 parapets to add to buildings or castle corners with crenelations. Down the road you could add 4" round towers if you like and you'd already have crenelations to use on the roof. Further reflection on the above - if your Battlements buy in gets to the point of 2x Straight, 2x Corner, and 2x Transition you should really consider the Mega Pack. 2x of each painted is $260, the Mega Pack at $295 painted is the rough equivalent of those plus half a Square Tower pack (~$52 value) with some hard to collect parts, plus some Iron Shutters (also hard to collect) and Greek Fire Projectors. mage1337 wrote: Ok geekjeff. I think I got it, and can lock-in my pledge. Just to double-confirm: For a broken out "Sorcerer's Sanctum", I'd need 1x Corner Battlements and 2x Straight Battlements? Or Just 1x Straight Battlements? The goal would be to literally "take off" the two rear towers from an RS - and deploy them independently. So I'm guess 2x Straight Battlements are needed, if I also want to upgrade the RS to battlements? Let's do some pictures to clear this up! Here it is with the back towers removed to make your Pseudo-Sorcerer-Sanctum, to the above you need to add 1x Straight and 1x Corner Battlements packs, for a total of 2x Straight, 2x Corner, 2x Transition. You have some parts leftover there. You could add a Straight Walls pack and Ramparts Inside Walls or MWOD, and then your castle is 8" wider. Add the pieces outlined in black. Ok geekjeff. I think I got it, and can lock-in my pledge. If you're going with all Battlements on the RS, you can probably skip that Wall Platforms pack. You have to remove Wall Platforms to put Battlements on anyways. Yes you could build a Pseudo-Sorcerer's Sanctum with that, but if you want to build it simultaneously with the RS you'll need extra battlements to replace where the towers were broken out. Add a Straight Battlements and a Corner Battlements. To get closer to the Sorcerer's Sanctum look, I'd also add a Large Tower Roof and a Small Fortified Tower pack. Parapets are cool, but I don't know that you're getting enough small towers to get a lot of mileage out of them. But they're pretty cheap, if you want a pack to experiment with. - if you have a bunch of KS1 and/or KS3 parts, a Square Roof Platforms pack opens a lot of building possibilities. Also makes Double Thick wall sections more stable. - Cube Spacers seem super versatile - to build up elevations, make more Double Thick walls, or even stand in for a couple extra sections of castle wall in a pinch. Thanks so much for this advice! This really helps me focus my pledge. My understanding is the above will let me build a Royal Stronghold with Battlements, OR a GC Type Build with a "sort-of" Sorcerer's Stronghold broken out. I won't need any other packs (Like Wall Transition Packs) to affect these two structures. Is this right? Is there a cheaper way to grab the Bases - seems a bit wasteful - and I'm wondering if GC + SS is better? Lastly, what about parapets? Are they worth getting? Can they just be added to the RS "as is" with no other parts? And anything else vital to castle modularity I'm missing? For example, should I be going for Tower Roofs, Advanced Stone Builders, Butresses or Cube Spacers? Are any of these parts more useful than I am first understanding? 1) If you want to do Battlements on the outside and Crenellations on the inside, you can shuffle things around get it done with as little as 1x Straight Battlements and 1x Transition Battlements. If you want Battlements everywhere feasible (including Corner Battlements everywhere they'll fit) you need 1x Corner Battlements, 1x Straight Battlements, and 2x Transition Battlements. 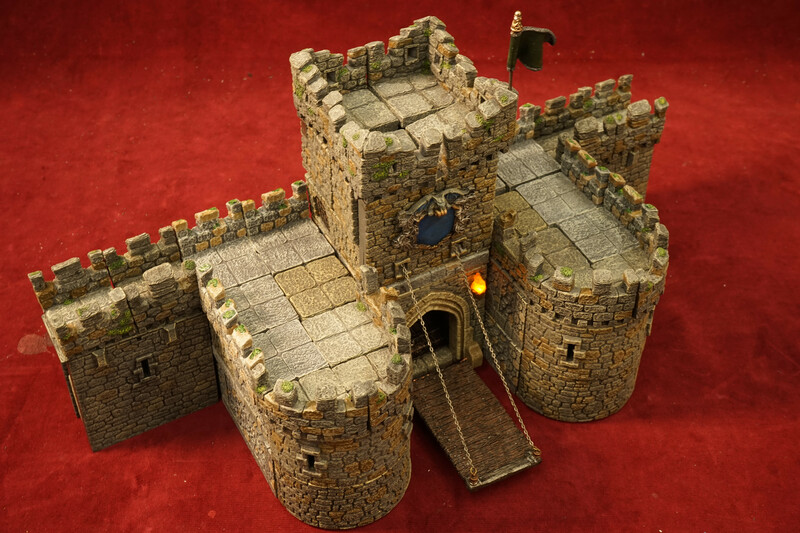 If you want to make sure you have EVERYTHING covered whether the towers are attached or detached and have some extra parts in case you ever wanted to expand the walls a bit, the Mega Battlements will happily stretch your wallet open and make that happen. 2) Nope, none of the Pledge levels include the upgraded Drawbridge part with winch & chains. Yes, you do need one extra bit to avoid Battlement issues - you need one 4x4 level of plain City Builder-type solid walls above the winch house so the descending corbels from the Battlements will fit. The Mega Battlements includes this. You could also use some CBS parts from your own collection if you have any, or use part of a Square Tower or Advanced Builder add-on if you don't. 3) To make the just the Royal Stronghold outline without the interior keep or double thick back wall, the sets you listed plus 2x Tower Transitions and 1x Battlement Transitions would do the trick. That would make your towers 4 levels tall, instead of 5 like the Royal Stronghold. If you want them 5 tall and want a few Palace windows like the RS includes, add 1x Large Tower Fortified and 1x Large Tower Palace. If you want the little 4" tower extensions, add 2x Wizard's Outpost. 4) You can't really do Battlements well on the interior side of double thick walls, because there are no inside corner pieces for Battlements. Your best options are Straight Crenellations (from KS3, available now in the webstore) or plain floor tiles of some sort. I don't think that modularity is really a big concern for the Royal Stronghold vs Grand Citadel. Really if you just yank out the double thick back wall and keep, add an inexpensive 8x8 Flagstone Floor pack and Wall Platform pack you're back at a standard-issue GC shape with a bunch of extra decor. Only other thing you'd maybe need to work around is the two Single Door tower walls in the back instead of Twin Door walls. geekjeff wrote: This is correct, you'd be required to have two of those 6 corners on a double-thick wall, or use one of the many Roof Platforms included in some other manner. I figured I could use some combination of Cube Spacers/Dungeon Floors to get the height correct and just have a square column landing there, if I didn't want to double thick it. Alternately, the Tower Transition packs do contain Corner Transition Walls as well as the Twin Doorway Walls you'd want if you're not doubling those corners (note that RS otherwise contains 2 Twin Doors, 2 Single Doors. Also note, if you're doing single thick walls with full Battlements I think you can opt to just ditch the Wall Platform/Roof Platform layer altogether, if you wanted to simplify things. Thanks. That eliminates the RS for me. I appreciate all your help on understanding these packages. For my battlements/crenelations, I'll be purchasing some battlements but not a full allotment as I have a ton of KS 3 Crenelations. Plus I really want the Roof Platform packs (2) for use with CBS as well as Castles. 1) I prefer battlements. I see RS doesn't use full battlements - how hard is it to add to the RS? If I like Battlements, should I just be on the GC plan? 2) Does neither the RS nor the GC include the upgraded drawbridge? (Non-motorized) If I want to add, do I need anything special to avoid battlement transition problems? 3) What is the cheapest, most basic way of replicating just the RS "outer structure" (no inner keep) with GC pledge? Is it it just +2x Watchtowers, +1 Mega Battlements Pack, +2 Corner Cut Out Pack? 4) If I go for double thick walls, what do I need to protect the inner walls? Will another Mega Battlements pack work, or do I just want Straight Crenalations? In short, I'm leaning towards Royal Stronghold because it's just simpler, seems a bit cheaper, and I don't really care about the stretch goals. However, I'm nervous that if I want to grow my castle later - I'll be stuck buying whole DF packs for a few odd pieces, since the RS isn't very modular. Is this a real concern? Stormfury wrote: @geekjeff - ...Does it have enough Corner Wall Transition Platforms for 6 corner towers? I'm assuming those are required for towers? The RS only has 2 of these despite 4 corners with towers (0 Corner Wall Platform). I'm guessing this is because the back half of the castle is double walled. This means you're restricted (without add-ons) to 2 corner walls with towers and 2 double sided corner walls with towers. This is correct, you'd be required to have two of those 6 corners on a double-thick wall, or use one of the many Roof Platforms included in some other manner. I figured I could use some combination of Cube Spacers/Dungeon Floors to get the height correct and just have a square column landing there, if I didn't want to double thick it.